The VimNet 9000 is a specialized PDP-11 derivative minicomputer designed for auto dealerships. The system is built upon a Motorola 68020 microprocessor running at 16 MHz and is equipped with 4MB of RAM. A tape drive and bulky plexiglass hard drive provide secondary storage. The hard drives in these devices were originally only 140 MB, but the drive in this particular unit is marked with a sticker stating that it was serviced in 1991, suggesting a possible upgrade. This system was built sometime between 1979 and 1981. The most noteworthy feature of the VimNet is that it is gigantic. The VimNet server has connections for up to eight TC-1000 terminals. Even in the modest configuration shown here, with only a single Reynolds & Reynolds TC-1000 smart terminal, the combined weight of the entire system is at least 45 kg. It boggles the mind to think of an era when a car dealership would require such computing infrastructure. 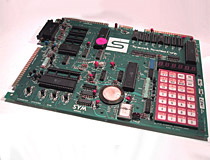 The SYM-1 is a single-board computer originally developed as a 6502 microprocessor evaluation board. The SYM-1 is an enhanced clone of the official MOS KIM-1 evaluation board, adding true RS232 and other improvements. The SYM-1 also shares the same I/O connectors as the Rockwell AIM-65, another 6502 evaluation system. The Macintosh Plus was released in 1986, shortly after Steve Jobs , one of the founders of Apple Computer, was exiled from the company due to 'questionable design views'. Steve Jobs had saddled the original Macintosh 128 with a tiny amount of ram and no hard drive; he felt that the sound of a hard drive spinning would detract from the overall ascetics of the machine. 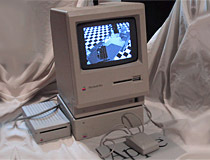 As an end result, the original Macintosh, while quite attractive in appearance compared to it's competitors, was not very useful as a computer. The Plus was a stopgap attempt to rectify the situation, it had one megabyte of ram, compared to the original Macintosh's 128 kilobytes of ram; a huge amount of memory for the time. 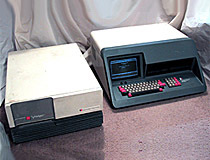 In fact, the Plus was one of the few computers of the era that had more ram than mass storage; the Plus still had no hard drive, only a single 800K floppy drive was available for secondary storage. Despite this, it was the first Mac that was actually usable, and vast quantities of them were made and sold. 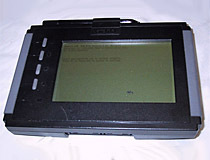 The GRiD PalmPAD 2351 is a very early tablet computer that was designed for use by nurses and other people that needed to have a computer strapped to their arm at all times. The PalmPAD 2351 was manufactured in 1991, a full two years before the Apple Newton was released. The 2351 has no hard drive; a modified version of DOS is stored on a ROM, which permits it to boot without any configuration. The 2351 also has 2.5MB of battery-backed RAM, and a PC card slot allows the addition of hard drive space by means of flash memory PC cards.